I have been receiving this error in my web config. can anyone help me with this all the suggestion that i have find does not help me. Parser Error Message: The connection name 'DNSConnectionString' was not found in the applications configuration or the connection string is empty. I have added my connection string on the IIS as per system requirements, i must not put it on the web.config file. is there a way how can i solved this error just using my IIS config for connection string. As far as I know, multiple IIS management console setting will also modify the web application's web config. For exmaple,. you could modify the url rewrite setting in the IIS manager console. If you apply the setting, you could find the url rewirte rule has already added into the web application's web config. So I suggest you could direclty open the web.config file in the web application and modify the connection string tag. 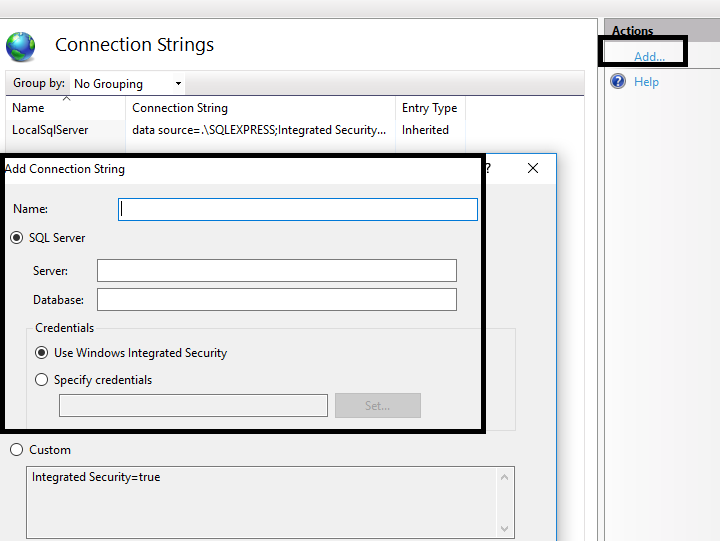 If you want to add the connection string in the IIS manager console, I suggest you could open the IIS manager console and find the connection string setting and add the DNSConnectionString with the database connection string.